Well-known restaurateurs seem to be flocking to the DC area to open burger restaurants. New York chefs Danny Meyer and Bobby Flay, as well as Top Cheftestant Richard Blaise are all headed this way with burgers and shakes. Soon we may be over-saturated with fries. The more I read about burgers, the more I desire them. I was finally able to satisfy my craving this week with a trip to BGR The Burger Joint in Bethesda. Six of my colleagues enthusiastically joined me. Initially the menu presented a dilemma. BGR is featuring a Snooki (of the Jersey Shore) Burger during the month of September. In keeping with my need to merge food with reality TV whenever possible, I was tempted to try this burger topped with grilled jalapeno, cream cheese, and a fried pickle. Tempting. But I couldn’t resist the burger I had during my first BGR outing earlier this year. It had been calling to me ever since. It’s called “The Greek.” This burger was not only featured on Food Network’s “Throwdown with Bobby Flay.” It won. So, thankfully I did not have to sacrifice a connection to reality TV with my order. The Greek is “made of fresh ground leg of lamb, seasoned with cumin, mint and garlic and topped with tzatziki sauce and feta cheese. Lamb and feta cheese are two of my favorite ingredients This burger is divine and is now on my list of Best Things I Ever Ate. The fries at BGR are worth a mention. They are a nice crisp texture, they are delivered hot, and they are perfectly salted. My advice is to go with someone who will order the sweet potato fries and share. The opinions expressed by my colleagues regarding their burgers were varied. One ordered the veggie burger and absolutely loved it. The Wellington was declared a little off (roasted mushrooms, caramelized onions, garlic with a touch of mustard seed and blue cheese) I tried it and thought it was pretty good but this is not your typical burger. The sliders were not a hit, according to the person who preferred Five Guys. My only complaint about BGR is the price. I spent $19 for burger, fries, and a soda. Pretty steep, particularly for lunch. Granted, it was a great burger, very good fries, and…well soda is soda. I have been reading some good things about a fairly new burger place in Bethesda called Fresh Grill. And I still need to try the Ray’s Hell Burger, which I understand can be found at Ray’s the Classics in Silver Spring. If I can just get that lamb burger out of my head, I may be able to give some of these others burgers a fair shake. If you ever want to go to the original Ray's Hellburger, give me a call — only 3 miles from my place! 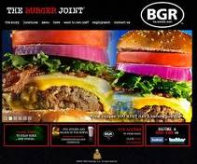 And, in case that is not enough temptation, BGR is in the Lyon Village shopping Center, across from your first married home.